While Salvadorans were lined up to vote for a their new president this Sunday, A Salvadoran newspaper "La Prensa Gráfica" sent a drone for the coverage of the event. This is the first time anyone in El Salvador has used a drone for journalism, La Prensa Gráfica announced. La Prensa has a graphic explaining its drone's abilities. The DJI Phantom 2 Vision quadcopter takes high-quality photos and videos, is able to fly as high as 2,300 feet (716 meters), and can stay in the air for 25 minutes. A human pilots it remotely. La Prensa follows some great examples of drone journalism in Latin America. La Prensa de Peru has used drones for reporting on road work and closures. Last year, Brazilian media Folha de São Paulo and Globo used drones to offer views of protesters demonstrating against government spending and rising public transportation prices. 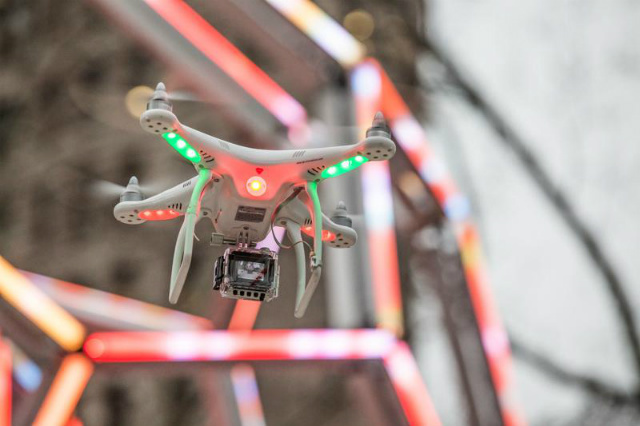 Considering how difficult it is to estimate the sizes of crowds, a drone's-eye view could be especially helpful for reporting on demonstrations. The Prensa Gráfica drone didn't seem to have captured anything unusual this time. A video from Sunday shows short lines and calm folks at polling locations. At one location, a school, you can see voters holding up their cellphones to take pictures of the drone hovering above them. Maybe the best drone-taken pictures were those showing members of the National Republican Alliance (Arena) party in formation for speeches and prayer.